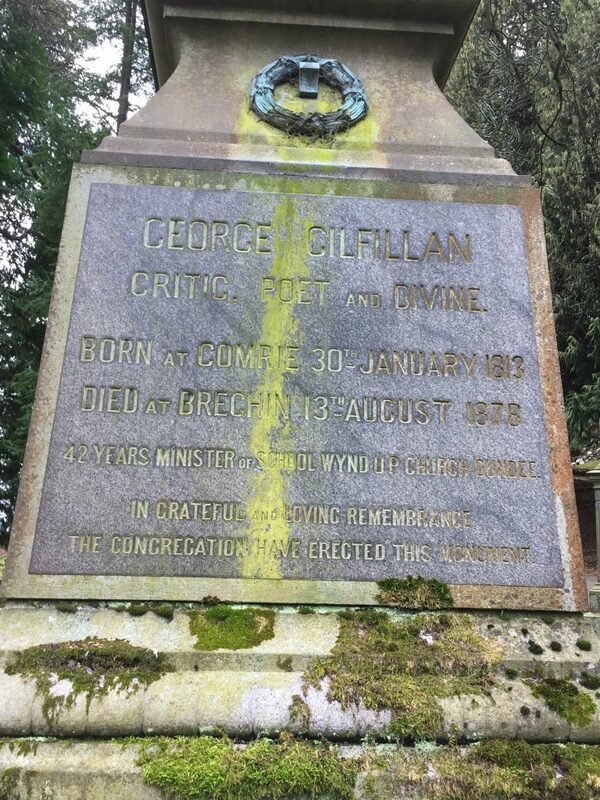 George Gilfillan was a popular lecturer in many local educational and cultural institutions, and he supported campaigns for political progress on the public platform. His involvement with local societies and bodies include: The Watt Institution; Dundee Literary Institute; Dundee Literary Societies Union; Dundee Anti-Corn Law Association; Voluntary Anti-State Association; Young Men's Protestant Society; The Friends of Italy (Dundee branch); Dundee Working Men's Association; Committee member of Dundee Free Library, in Albert Institute; Dundee Young Men's Christian Association. Margaret Gilfillan was president of Dundee Ladies Anti-Slavery Association, and National Society for Promoting Women's Suffrage (Dundee branch) - Gilfillan providing keynote addresses for meetings. In his 42 years at School Wynd Church, George Gilfillan preached a liberal and progressive version of the Christian faith. His attempts to reconcile religion with liberal thought and scientific progress brought censure from the Dundee UP presbytery. Nevertheless, his ‘Sunday Evening Lectures’ , popular sermons on contemporary affairs, attracted large crowds and he was one of the first Scottish clergymen to preach on Darwinism and biblical criticism. Gilfillan’s belief in self-improvement attracted a largely working class congregation of men and women committed to individual and social progress. Gilfillan and his parishioners were active in the Watt Institution and on the Free Library committee. School Wynd Church was at the forefront of promoting causes such as the abolition of slavery, hosting the visits of Frederick Douglass and Harriet Beecher Stowe to Dundee, Gilfillan delivering the civic addresses.. After Gilfillan’s sudden death in August 1878, huge crowds of factory workers, ‘the largest concourse of mourners that ever honoured the remains of a townsman’ followed his funeral cortege to Balgay Hill. His commitment to religious, cultural and material progress was continued in the founding of the Gilfillan Memorial Church in Whitehall Crescent in 1887. 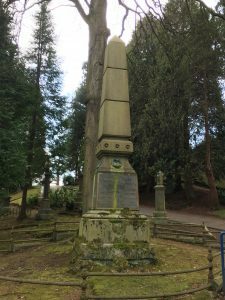 ‘Gilfillan of Dundee’ was a prominent figure in the public life of Dundee, and well known across Britain, as a popular lecturer on literary and cultural topics, and as a public orator, in support of the reforming movements which dominated the mid-Victorian period. In Dundee, Gilfillan lectured at the Watt Institution, addressed literary and benevolent societies, and led public commemorations of cultural events, notably the Burns centenary in 1859, and the Shakespeare Tercentenary in 1864. Through his association with John Leng and the Liberal establishment in Dundee, Gilfillan addressed numerous public meetings. He was notable for his impassioned oratory in the cause of justice and freedom from tyranny, for example in the Anti- Corn law and Anti-Slavery campaigns of the 1840s; in support of Kossuth, Garibaldi and the Italian liberation in the 1850s-60s; and as a committed supporter of the drive for political reform. In addition to grand public events, Gilfillan was noteworthy for his willingness to speak at workers’ meetings, unlike other local clergy. Gilfillan’s career as an author was launched in 1845 with his Galleries of Literary Portraits, sketches of contemporary authors, followed by Bards of the Bible (1851), Martyrs and Heroes of the Scottish Covenant (1852) and numerous works on the literary and religious heritage of the British Isles over the next thirty years. Gilfillan was a regular contributor to the Scottish periodical press as critic and book reviewer, for example in the Dundee Advertiser. His own verse epic, Night: A Poem (1867), met with lukewarm critical response, and his literary reputation rested on his criticism, editing the forty eight volumes of the Nichol’s Library Edition of the Poets (1853-60) and The National Burns, published posthumously in 1879. ‘Rev. George Gilfillan of Dundee/There is none can you excel;/You have boldly rejected the Confession of Faith,/And defended your cause right well/The first time I heard him speak/’Twas in the Kinnaird Hall,/Lecturing on the Garibaldi movement,/As loud as he could bawl’. Old Parish Records. Comrie, Perthshire. Baptism. 25 February 1813. 341/20 37 p.327. Scotlands People website. Dundee Directories 1836-78. Local Studies, Central Library. Statutory registers. Brechin, Forfarshire. Death. 13 August 1879. 275/126 p.42. Scotlands People Website. McKerrow, J (1830) The History of the Secession Church. 2 vols. Edinburgh; McKelvie, W (1873) The Annals and Statistics of the United Presbyterian Church. Edinburgh. Annual Reports of the Watt Institution, Dundee (1840-50). Lamb Collection, D2821-22. Local Studies, Central Library. Magazine of Dundee Literary Institute (1846-50). D22014-17; Magazine of Dundee Scientific and Literary Institute (1846-50) D22021-23. Local Studies, Central Library. Press report of Corn Law meeting, Dundee. Dundee Advertiser, 4 March 1842. Church Records. School Wynd Church, Dundee. Kirk Session and Managers Minutes. CH3/93/5-12.Dundee City Archives. Begg, Peter (1866) Free Libraries, their Working and Advantages: A Report. Lamb Collection, LC274; 'Report of the Dundee Free Library Committee'. Lamb Collection, LC376(3). Local Studies, Central Library. Annual reports of Dundee Ladies Anti-Slavery Association (1853-60). Lamb Collection, LC311; Press report. 'Mrs Stowe in Dundee'. Dundee Advertiser, 26 April 1853. Local Studies, Central Library. Dundee Advertiser, 14 August 1878, 19 August 1878; Dundee Obituary Book. FH5 Local Studies, Central Library. Church Records. Gilfillan Memorial Church, Dundee. Session Minutes, 1879-80. GD/X100/19. Dundee City Archives. Black, Gilfillan of Dundee, pp.197-219. Press report. Gilfillan lecture, 'The Present State and Future Prospects of Italy', Dundee. Dundee Advertiser, 7 October 1851; 10 October 1851. 'Great Meeting of Mill Operatives in Dundee', 14 July 1872. Lamb Collection LC196(1). Local Studies, Central Library; Dundee Advertiser, 15 July 1872. Gilfillan, George (1845) A Gallery of Literary Portraits. Edinburgh; (1851) The Bards of the Bible. Edinburgh; (1852) The Martyrs and Heroes of the Scottish Covenant. Edinburgh; (1869) Modern Christian Heroes: A Gallery of Protesting and Reforming Men. London. Gilfillan, George (1867) Night: A Poem. London; (1879-80) The National Burns, Including the Airs of all the Songs and an Original Life of Burns by the Editor. 2 vols. (Glasgow and London); Black, Gilfillan of Dundee, pp.180-213. McGonagall, William (1992) 'Brief Autobiography', in Poetic Gems selected from the works of William McGonagall, Poet and Tragedian, p.7. Edinburgh. Birlinn; Gilfillan's 'Testimonial' in Johnston, Ellen (1867), The Autobiography, Poems and Songs of Ellen Johnston, the 'Factory Girl'. Glasgow. The information above about George Gilfillan has been collated from a range of digital and hard copy sources. To the best of our knowledge it is correct but if you are relying on any information from our website for the purpose of your own research we would advise you to follow up the sources to your own satisfaction. If you are aware of an inaccuracy in our text please do not hesitate to notify us through our Contact page.